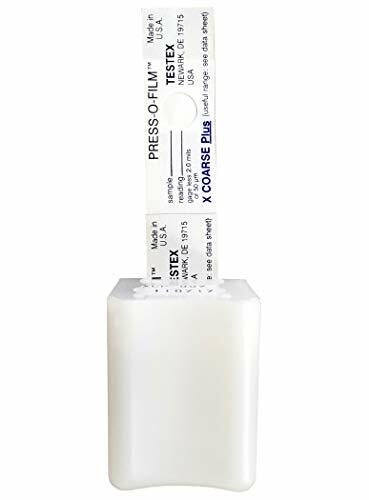 The Press-O-Film X-Coarse Grade (1.5-4.5 mils / 38-115 microns) Replica Tape Roll is used to measure the Testex Tape and determine the average maximum peak-to-valley height of the blasted profile. Measurements are made by firstly zeroing the gauge on 50m (2mils). This is to allow for the film backing. Place the replicated area between the anvils and gently lower the moveable anvil onto the film. The reading can now be taken, giving you the average peak-to-valley height of the blasted profile. 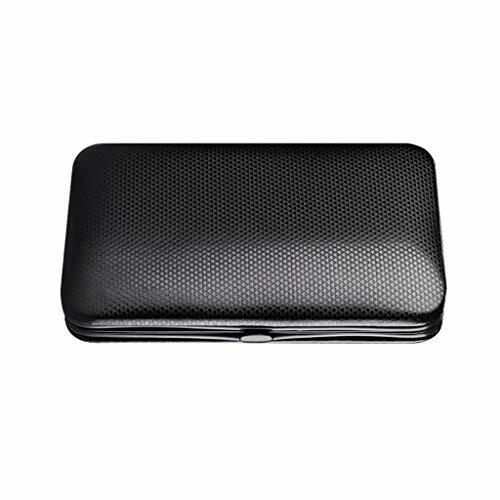 Supplied in a Carrying Case with Burnishing Tool. 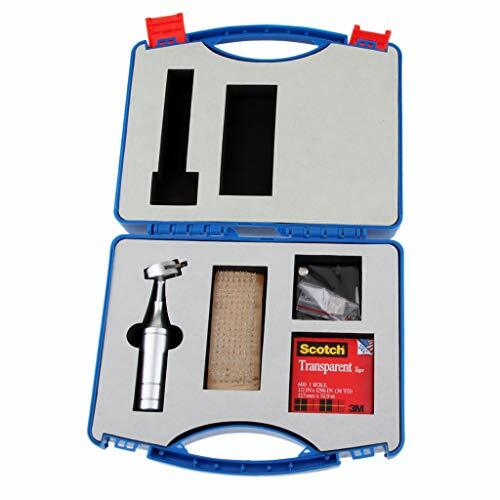 The Testex Snap Gauge is available in a Test Kit, comprising 2 rolls of X coarse Testex (specify if you require other grades), Snap Gauge, Training Surface, Burnishing Tool and instructions. 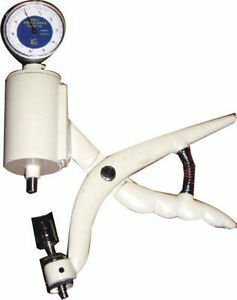 Testex Micrometer Dial Thickness Gage. 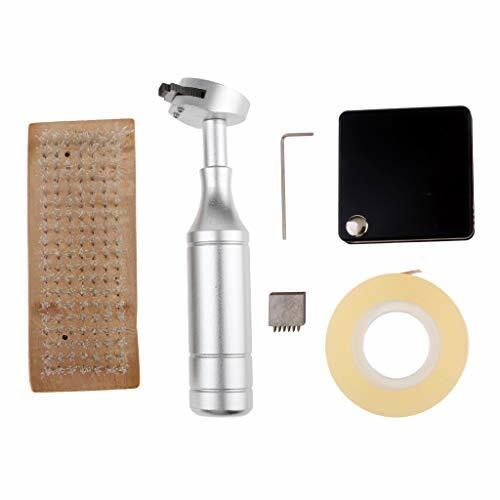 To be used with Testex replica Press-O-Film Tape to measure The Testex Testex Press-O-Film Replica Tape Kit with Micrometer Dial Thickness Gauge Inch Units, Coarse and X-Coarse Tape Rolls, Training Surface and Burnishing Tool is surface roughness of blast cleaned surfaces. 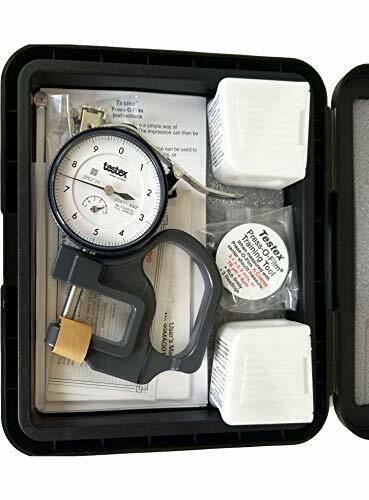 Testex Micrometer Dial Thickness Gage is used in conjunction with a Testex replica tape for acquiring surface profile measurements according to Method C in ASTM D4417. The replica tape is rubbed onto the abrasive blast cleaned surface forming a reverse replica of the peak-valley pattern in the steel. The replica is quantified using a spring loaded micrometer to determine the maximum peak-to-valley depth. The Press-O-Film Coarse Minus Grade (0.5-1.0 mils / 12-25 microns) Replica Tape, Roll is used with a gauge to measure the surface roughness ("profile") of blast-cleaned steel. 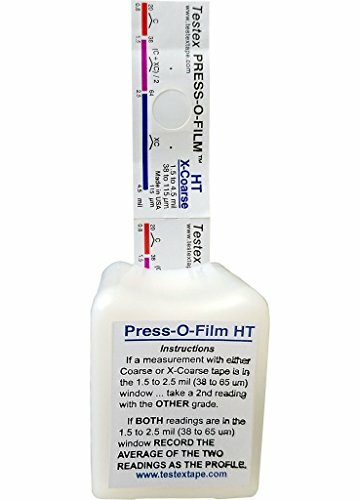 Testex Press-O-Film Replica Tape offers a unique replica technique and with a simple snap gauge will allow you to take accurate, low-cost blast-surface profile measurements. Testex makes surface replicas easy to obtain and produces average maximum peak-to-valley readings that ensure optimum blasting effectiveness. Replicas can be retained for future needs.The accuracy of Testex measurements is due to an innovative two-level film that can produce virtually exact replicas of the abrasive blast surfaces. The film is available in three different thickness grades to cover the most common range of blast profiles.Measurements can be taken in locations that are not possible using conventional stylus devices, e.g. internal pipe diameters and grooves, etc.Easy to use, remove the protective paper from the tape and place firmly on the blasted surface. Apply moderate pressure with the Burnishing Tool over the circular cut-out in the tape. Remove the tape. The replica is now ready for measurement using the Snap Gauge. The X-Coarse Plus Grade (4-6.5 mils / 100-165 microns), Roll is used with a gauge to measure the surface roughness ("profile") of blast-cleaned steel. Testex Press-O-Film Replica Tape offers a unique replica technique and with a simple snap gauge will allow you to take accurate, low-cost blast-surface profile measurements. Testex makes surface replicas easy to obtain and produces average maximum peak-to-valley readings that ensure optimum blasting effectiveness. Replicas can be retained for future needs.The accuracy of Testex measurements is due to an innovative two-level film that can produce virtually exact replicas of the abrasive blast surfaces. The film is available in three different thickness grades to cover the most common range of blast profiles.Measurements can be taken in locations that are not possible using conventional stylus devices, e.g. internal pipe diameters and grooves, etc.Easy to use, remove the protective paper from the tape and place firmly on the blasted surface. Apply moderate pressure with the Burnishing Tool over the circular cut-out in the tape. Remove the tape. The replica is now ready for measurement using the Snap Gauge. 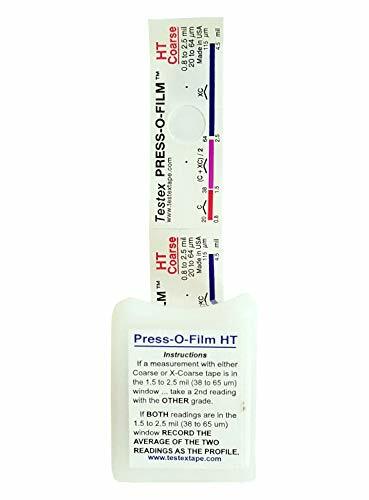 The Press-O-Film X-Coarse Plus Grade (4.6 - 5 mils / 116 - 127 microns) Replica Tape, Roll is used with a gauge to measure the surface roughness ("profile") of blast-cleaned steel. 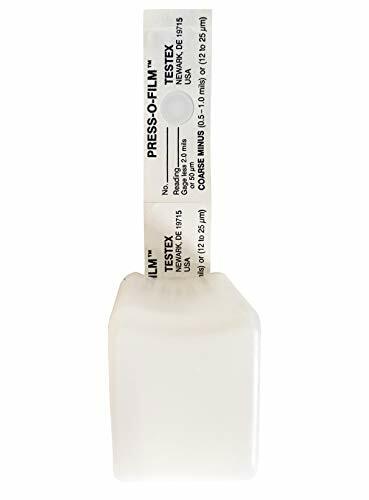 Testex Press-O-Film Replica Tape offers a unique replica technique and with a simple snap gauge will allow you to take accurate, low-cost blast-surface profile measurements. Testex makes surface replicas easy to obtain and produces average maximum peak-to-valley readings that ensure optimum blasting effectiveness. Replicas can be retained for future needs.The accuracy of Testex measurements is due to an innovative two-level film that can produce virtually exact replicas of the abrasive blast surfaces. The film is available in three different thickness grades to cover the most common range of blast profiles.Measurements can be taken in locations that are not possible using conventional stylus devices, e.g. internal pipe diameters and grooves, etc.Easy to use, remove the protective paper from the tape and place firmly on the blasted surface. Apply moderate pressure with the Burnishing Tool over the circular cut-out in the tape. Remove the tape. The replica is now ready for measurement using the Snap Gauge. 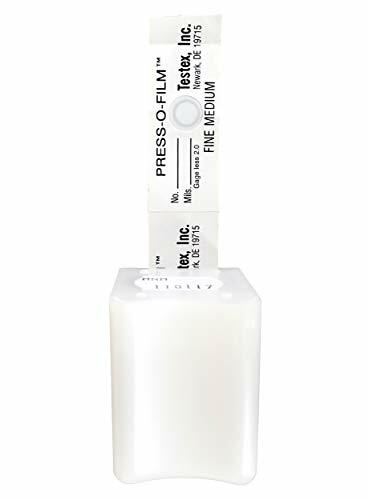 The Press-O-Film Medium Grade (5-75 microinch / 0.1-2 microns) Replica Tape, Roll is used with a gauge to measure the surface roughness ("profile") of blast-cleaned steel. Testex Press-O-Film Replica Tape offers a unique replica technique and with a simple snap gauge will allow you to take accurate, low-cost blast-surface profile measurements. Testex makes surface replicas easy to obtain and produces average maximum peak-to-valley readings that ensure optimum blasting effectiveness. Replicas can be retained for future needs.The accuracy of Testex measurements is due to an innovative two-level film that can produce virtually exact replicas of the abrasive blast surfaces. The film is available in three different thickness grades to cover the most common range of blast profiles.Measurements can be taken in locations that are not possible using conventional stylus devices, e.g. internal pipe diameters and grooves, etc.Easy to use, remove the protective paper from the tape and place firmly on the blasted surface. Apply moderate pressure with the Burnishing Tool over the circular cut-out in the tape. Remove the tape. The replica is now ready for measurement using the Snap Gauge. Rechargeable. A 180mA lithium-battery and a USB cable is included. No battery replacement. 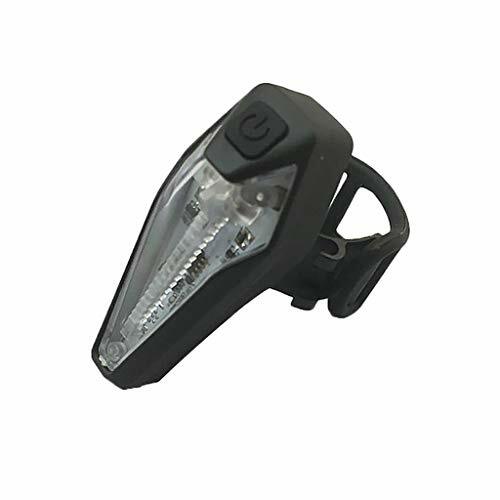 2 light modes: Steady on mode and flash mode are available. Long runtime. Lasting up to 3.5 hours (steady-on mode) or 6 hours ( flash mode) on a single charge. 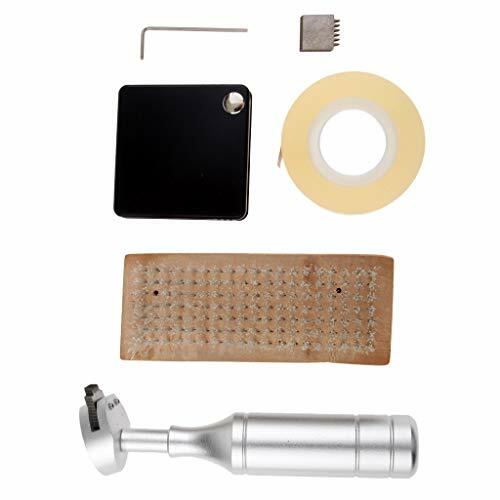 15 pieces of stainless steel manicure and clean tools. 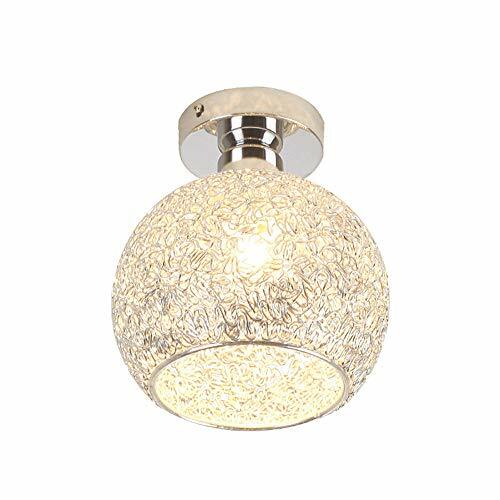 Perfect for hallway, stairway, aisle, kitchen, porch, dinning room, bedroom, bathroom etc. 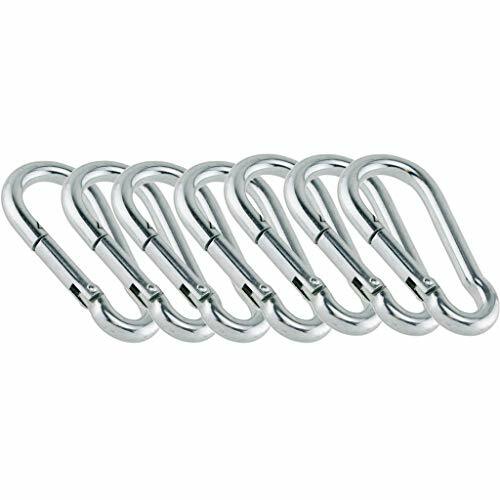 Great for hanging water bottles and other items from backpacks, clipping on keys to belt etc. and various camping, hiking, and fishing applications. Notice: Not for mountaineering, rock climbing, ice climbing and high-altitude games for your safety. HIGH IMPACT RESISTANT CONSTRUCTION & PRISM CONSTRUCTION, MORE STABLE. The prism construction is very easy to plug into the soil stable which is not spin. Be able to withstand maximum tension to 110 pounds. 2 built-in ground stakes. The new design circle plate for the fishing rack holder easier to plug into soil than any other old version. You can put your hand directly on the plate and push it to the soil. Never rusty & Anti-corrosion. All metal construction. 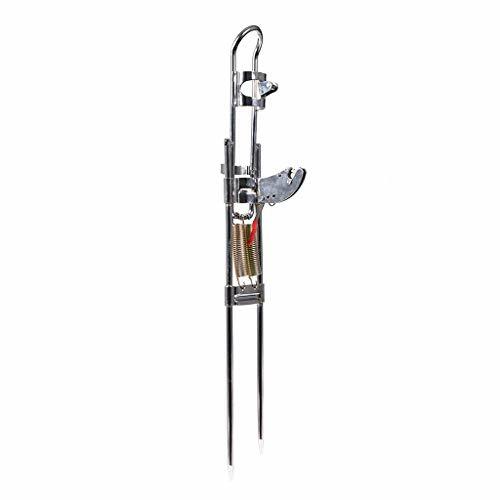 This fishing rod holder is totally made of high quality Stainless. - Made of high quality aluminum alloy and white steel, durable, sturdy, practical. - 1mm 11 teeth or 3mm 6 teeth blade is mounted in the handle for high precise machined presenting. - Using the cutting edge of the Baige knife itself, cross-cutting plastic, metal coating, coating surface coating. - With a standard tape to discriminate the surface of the coating after peeling off the cutting surface. - Widely used to evaluate the adhesion of coatings, bonding ability of the coating relative to the substrate. Please allow the error due to hand test, thank you. 1mm 11 teeth or 3mm 6 teeth blade is mounted in the handle for high precise machined presenting. * 1mm 11 teeth or 3mm 6 teeth blade is mounted in the handle for high precise machined presenting. * Using the cutting edge of the Baige knife itself, cross-cutting plastic, metal coating, coating surface coating. * Made of high quality aluminum alloy and white steel, durable, sturdy, practical. * Widely used to evaluate the adhesion of coatings, bonding ability of the coating relative to the substrate. * With a standard tape to discriminate the surface of the coating after peeling off the cutting surface. 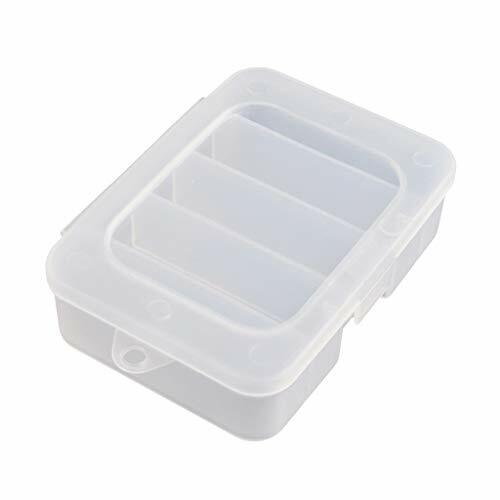 Made of high quality aluminum alloy and white steel, durable, sturdy, practical. Using the cutting edge of the Baige knife itself, cross-cutting plastic, metal coating, coating surface coating. With a standard tape to discriminate the surface of the coating after peeling off the cutting surface. Widely used to evaluate the adhesion of coatings, bonding ability of the coating relative to the substrate. 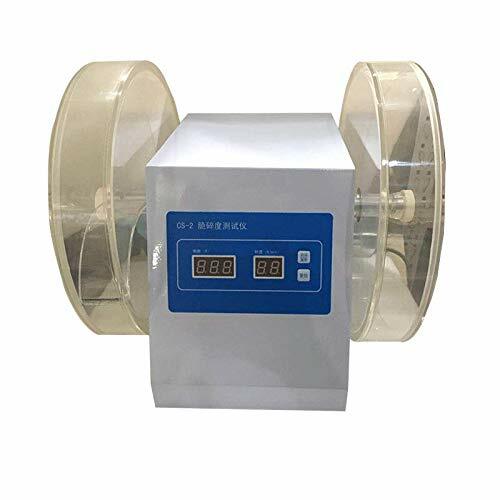 CS- Tablet Friability tester consists of control system, transmission part, turntable part etc. and centrally controlled by precision auto-control system consisted by SCM. It has features of concision style, high-auto-operation, simplified control, high accuracy, high sensitivity and reliably capability. CS- Tablet Friability tester consists of soleplate, legs, main box, front panel, rear panel etc. CS- Tablet Friability tester consists of control system, transmission part, turntable part etc. and centrally controlled by precision auto-control system consisted by SCM. It has features of concision style, high-auto-operation, simplified control, high accuracy, high sensitivity and reliably capability. Meets with CP, USP, EP and JP requirements and have microprocessor control.